For this session of Cooking School I am keeping to the current Arabian Theme that has dawned on a few blogs ;-). What I realized while doing the roundup is that many of you tried your hands for the first time at this kind of cuisine. So I thought, although we had a few recipes for Hummus for the Monthly Mingle round-up, I could share a recipe for those who could not take part and are not familiar with this cuisine just how easy it is to make a simple and healthy Arabic style dip. When I make hummus I am forever experimenting with herbs and spices. 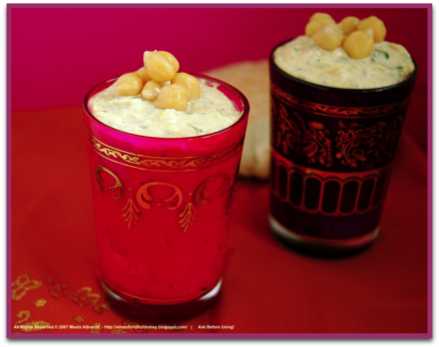 This time I chose a refreshing herb to complement the rich texture of the chickpeas. Chickpeas, also known as garbanzo beans, are not very easy to photograph! Actually they are rather boring to photograph. There is no zazzy color nor do they have an interesting outer texture to them! However they have a fantastic nutlike taste and are very versatile legumes. They are often found in many Middle Eastern and Indian dishes and can come in the form of falafels, in curries or as dips. While I picked chickpeas that are beige in color, there are varieties that feature black, green, red and brown beans. Above all chickpeas are fiber All Stars! they are rich in soluble and insoluble dietary fiber and can lower cholesterol. You'll find more health benefits for chickpeas here. Chickpeas are available dried in packets or canned. When selecting dried chickpeas make sure that there are no signs of insect damage or moisture and that they are not cracked. 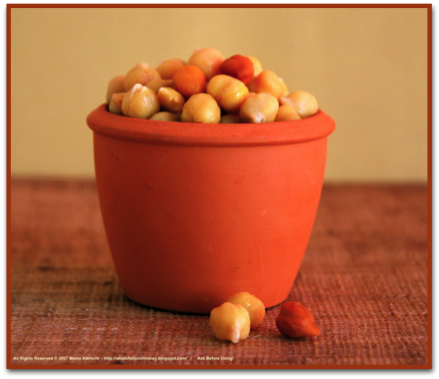 If you store dried chickpeas in an air tight container in a cool, dark and dry place they will last for up to 12 months. Unlike many canned vegetables, chickpeas do not loose much of their nutritional value and their is not much difference in the nutritional value of canned garbanzo beans and those you cook yourself. The mint in this hummus lends it wonderful aroma to the entire dip, making it refreshing and cooling for the warm weather. Mint is a herb known for its healing qualities and used often in Indian and Middle Eastern foods and medicine. Mint is well known for its ability to sooth the digestive system and reduce the severity and length of stomach aches. 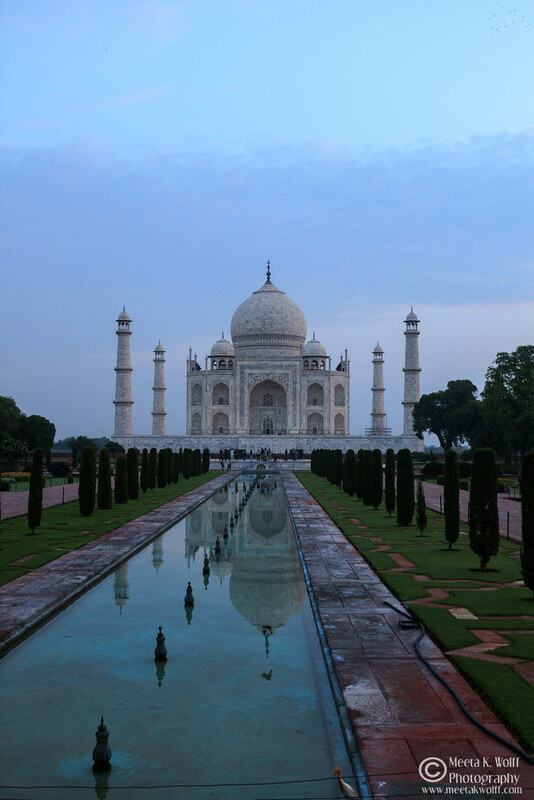 You can use mint in a variety of ways, however the most common is brewing mint leaves in a soothing mint tea. Buying fresh mint is better than the dried variety. If possible always go for the fresh leaves as it is in these leaves that you will find the true aroma and flavor. The leaves you buy should be vibrant and be a rich green color and they should be free from dark spots or yellowing. The best way to store mint leaves is to wrap them in a damp paper towel and place this in a plastic bag. Close loosely. In the refrigerator this should keep fresh for several days. In a pan roast the cumin seeds until they are fragrant. Take out and allow to cool. 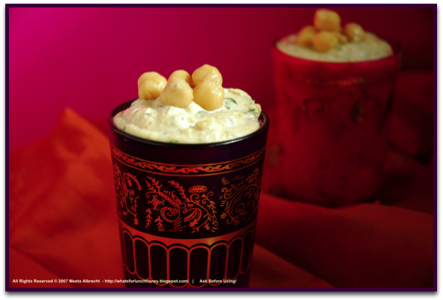 In a large bowl or blender puree the chickpeas, cumin seeds tahin paste and lemon juice into a fine paste. If the paste is too thick use some of the reserved liquid from the chickpeas. The consistency should not be liquidy but thick and creamy. Place in a bowl and fold in the herbs. Serve drizzled with olive oil and toasted pita bread sprinkled with thyme. An enjoyable dip for all occasions - parties, cocktails, picnics or just an evening in front of the TV. Hummus is one of the very common things we make at home. As a matter of fact we make this so often that Soeren can actually make it too. Every time we try a little something different. 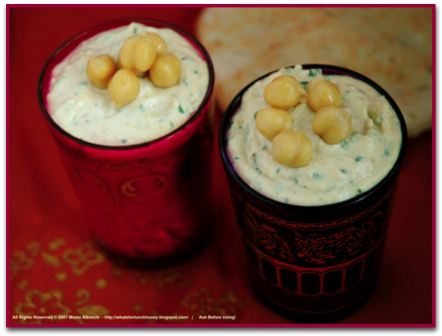 This minty hummus gives a real refreshing zing to your taste buds. 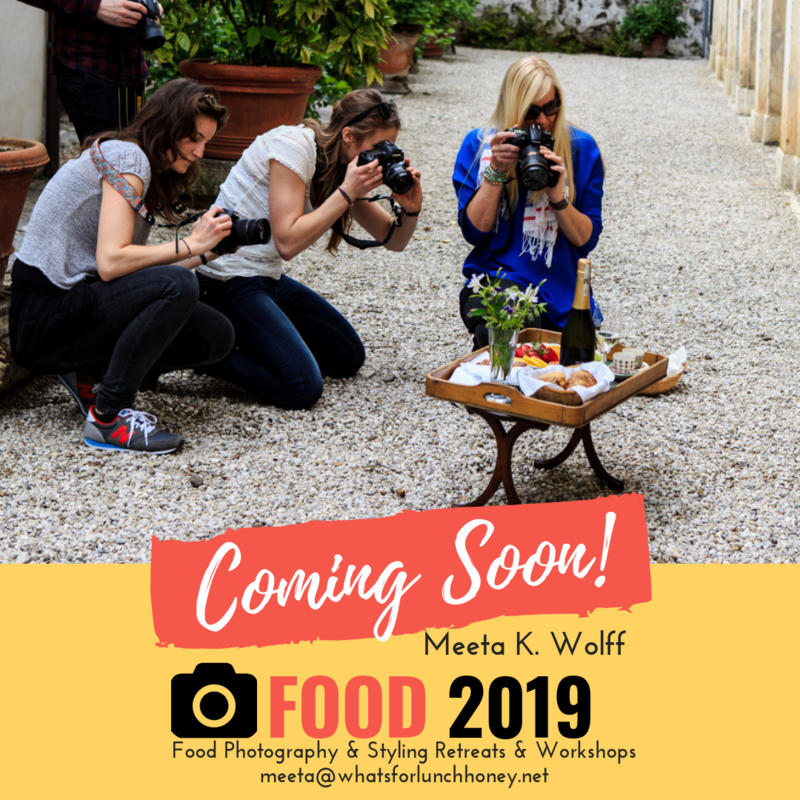 Don't forget to give your vote to WFLH and The Daily Tiffin for the Blogger's Choice Awards! 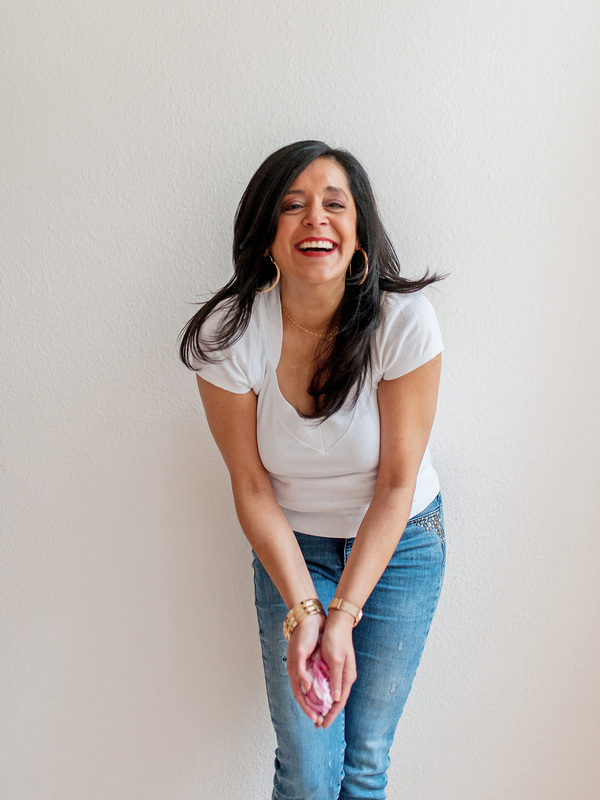 Hi Meeta! I love the sound of mint-y hummus! Thank you for all of your information regarding hummus and chickpeas... This is a spread that I'd love to experiment with more often! ...and beautiful MM roundup! You've inspired so many people! I love mint in my hummus, I have a nice black bean and mint hummus that is good too. I love hummus but I've not had any with mint and now I must! It sounds like a real natural. Sounds so good, I've never had mint in hummus before. Great recipe Meeta! a. there's now way you can make decent hummus out of canned chickpeas. b. hummus isn't a dip. You can dip things in a soup or a cup of coffee but this doesn't make them dips, right? c. mint and most other herbs are too dominant for hummus. They make you miss the REAL flavor. 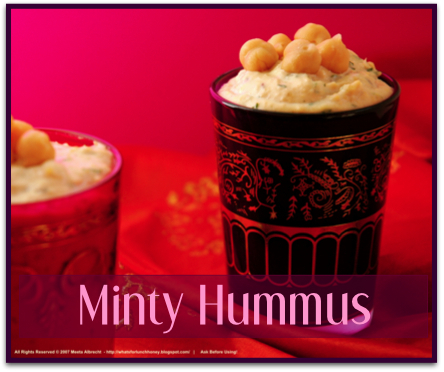 Minty hummus sounds delicious! I love those cups you used, very pretty! Hi all! I thought you would enjoy this. a. To be quite honest when I make hummus out of normal dried chickpeas going through the process of soaking over night etc. or use canned chickpeas there is really not much difference in the taste. The canned chickpeas I use are of a very good quality and it also leaves me the comfort of making a hummus at the spur of the moment. b. What would you call hummus then? I agree when dipping things in soup or coffee does not make them dips but if I am to categorize a hummus I would do so with guacamole & co. Maybe I am just ignorant but yes, even when I was living in the Middle East the Hummus was referred to as a dip. c. In my opinion cooking is about harmonizing an array of flavors to develop the tastes and the recipe itself. The original hummus is great as is but experimenting with different spices, herbs and ingredients makes room for a multitude of newer interesting flavors. My recipes on my blog are not about taking the same old dish and simply copying and posting it here. My blog and recipes are about taking a recipe playing around with it and sharing the results with my readers. Some may like it others may not .. but I hope they all will be prompted to experiment themselves. That is what I hope to achieve. 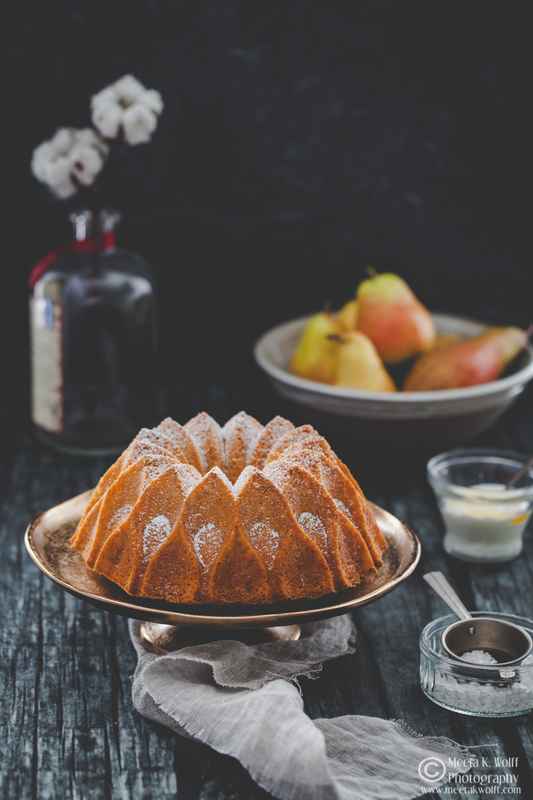 Meeta, the lighting, colour, and food styling of this post speaks volumes. No wonder your blog is nominated for best photography. I now have to go vote for the second category as I've already voted for the first. Great work. Another amazing set of photos. You are so talented! I love hummous and I love mint so combined I think they would be dreamy! I'm definitely taking part in this months mingle too! Last months roundup was amazing! Well, you certainly make photographing chickpeas seem easy. ;) They look lovely, as does your minty hummus. Your Arabian round-up was fabulous; I was so disappointed I wasn't able to participate. Congratulations on your nominations! (Tooting is in order). It's not surprising...you have a beautiful blog. 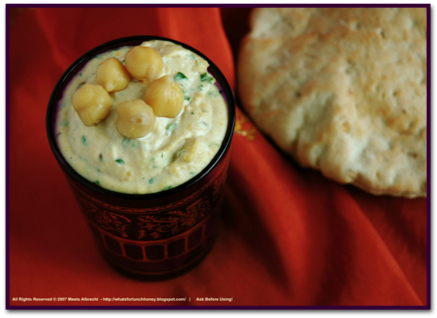 hey Meeta, Hummus and mint is a great combi, loved the pics. looks so vibrant! Delicious recipe - now that I'm addicted to hummus I want to try all the variations out there. Yes, it was a very refreshing creation. Different and yet something familiar. I hope you enjoy it when you all make this one. Come back and let me know what you thought. 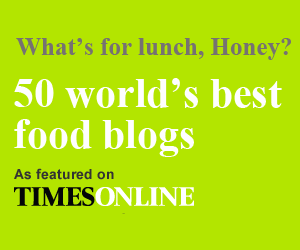 i recently started a food blog and thot i shud browse thru the others. each one i went to made me feel like a novice, but urs completely blew me!! i have no words for the pic above! really.. its amazing!! Nice twist on hummus. I love altering the recipe, but never thought of adding mint (which I am growing in my garden). Would you kindly clarify how much a "bunch" is. I think of a bunch as the quantity sold in a bag in the store, which is quite a bit of mint. Thanks for the Chickpeas recipe. I had selected this in my diet generator on www.desidieter.com and was looking for a good recipe.